Tak terasa Ulangan Tengah Semester akan digelar sebentar lagi. Tentunya kalian semua ingin mendapatkan nilai yang baik kan? Oleh karena itu kami ingin membantu teman-teman belajar bahasa inggris dengan soal tes bahasa inggris UTS yang bisa dipelajari di rumah. Bagi para guru juga semoga dengan adanya soal ini dapat membantu dalam hal pembuatan soal UTS Bahasa Inggris di sekolah. 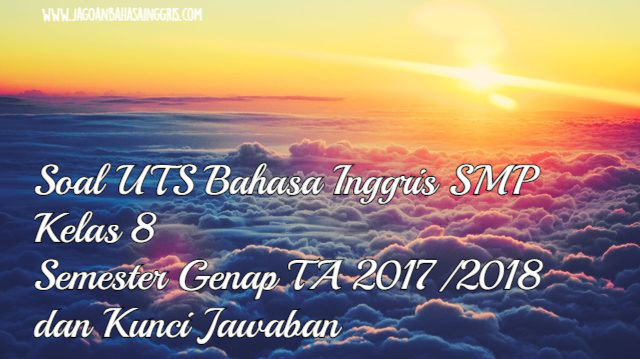 Semester Genap TA 2017/2018 berikut ini. “Pardon, O king,” cried the little mouse, “Forgive me this time, I shall never forget it; perhaps I may be able to do you a good turn some of these days.” The lion was so tickled at the idea of the mouse being able to help him. Then, he lifted up his paw and let him go. 2. What is the moral value of the text? 4. What did the little mouse do to prove his words? 1. It’s red and blue. 2. Nana, I think I have lost my only pencil. 3. I’m not sure I remember. Can you help me look for it? 4. Really? Where did you last see it? 5. Sure What is it like? 6. Doni : May I help you carry those books? Lingga : ……….. I can do it myself. 7. Dina : Would you like to come for dinner at my house? Luki : ……. I have to visit my grandmother today. 8. Dilan : Shall we go hiking to pangalengan next Saturday? Milea : ……….. We really need fresh air after a busy week. 9. Alucard : What do you think about our new classroom? Ruby : ……… We need to clean it. I went to flores last month. I went there to visit Australian Volunteer English teachers in Maumere, Ende and Bajawa. As a result, I also enjoyed the beauty of the island. I started my first day in Maumere with Jo Keating. After visiting several schools in the city, we took an amazing journey over the mountains to the south coast. We visited a new junior high school there. Then, I traveled to Ende to meet Sharon Kidman. Ende has a great market with a lovely selection of traditional woven ikat cloth, and great seafood. My next trip was to Detusoko, It is a mountain village. I went there with Ginny Edwards. Detusoko is not far from Mount Kelimutu. We woke up at 4 am to see the three different coloured lakes at dawn. It was truly inspiring. My final trip was to Bajawa. It is a small town high in the mountains. It was a very cold place. Yet my trip was fun and memorable. I would like to go back to flores one day. 10. Where did the writer go on his first day? 11. Where did the writer go after visiting Ende? 12. What was the writer’s last destination? 13. Which of the following statements is false according to the text? 14. Which of the following words is the synonym of “coast”? 16. Dinda : Would you pass me the sugar please? Reva : …… Here you are. 17. Dety : What do you think about this building? Rayya : ……. It looks fragile. 18. Budi : You look very busy with that assignment. Would you like me to help you? Kartika : …… I must do it by myself. 19. Dedi : Luki is very careless, what do you think about that? Ratu : …… He often forgets where he puts his keys. 20. Raina : Ruby is a nice person. Don’t you think so? d. I really don’t think so. Long ago, in the Neverland, there lived a very beautiful princess, Snow White. The Queen was her stepmother. She was very jealous of her beauty. So she wanted her to die. Snow white knew about the evil plan. She escaped into a forest. There she made friends with seven dwarfs. The queen knew it and she turned herself into an old lady. Then, she came to the dwarfs house and meet Snow White. Snow White didn’t realize that it was her stepmother. The old lady gave her a poisoned apple and Snow White ate it. As aresult, Snow White was put into sleep for years. The dwarfs was very sad, until someone comes to save Snow White’s live. It is Prince from the another kingdom. He revived Snow White with a kiss. Then, Snow White was back alive and she married the prince. They lived happily ever after. A. Answer these question based on the story above. 1. What kind of text is the story above? 2. When and where did the story happen? 3. What problems did Snow White have? 4. What happened to her then? 5. Who came to help her? 6. What did he to do to Snow White? 7. How did they live after that? 7. Snow White and Prince Charming married and live happily ever after.